Yes, I ought to stop the alliteration before it gets out of hand. Regardless, here is a list of some of my observations of Singapore life that are fairly distinctive, at least to an expat. Many people say that shopping is the national pastime of Singapore, but it tends to be true more often than not. Almost every single MRT station (the train that everyone takes) is connected with a mall, often multiple malls. The malls themselves are a bit different than their American counterparts, as they are vertically stacked. There aren't as many outdoor venues where you can walk around freely. Some of the glitziest malls include Vivo City (Singapore's largest), Ngee Ann City, and Suntec City. I will most likely do a full post on some of the fancier malls around town. This is a relatively common sign. Outraging the modesty of a woman is a serious offense. As in lengthy jail time. No peeing in an elevator. This was an issue, apparently? The sale of chewing gum is strictly banned. BUT, contrary to popular opinion, you are allowed to chew gum, as long as you properly dispose of it. Walking around your home naked is illegal. No hugging without permission. This would be a big issue for some Notre Dame dorm Mass attendees. Many of the touristy t-shirts claim that Singapore is a "fine" city, due to the high number of billable offenses. Additionally, caning remains a primary form of corporal punishment. 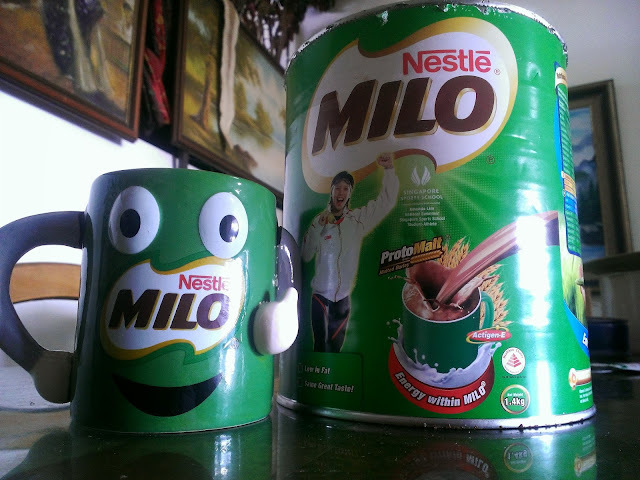 This is actually a worldwide phenomenon, but my first encounter with Milo has been in Singapore. It is essentially a rival to Ovaltine or even Swiss Miss hot cocoa. It is phenomenal stuff. And they sell cool coffee cups. What makes it really interesting is the extent to which it has become ingrained in local diets. Both hot and cold Milo are commonly sold at hawker stalls. McDonald's sells it. Espresso machines at the office have a dedicated Milo button! And it's not only in drinks, as many desserts and bars trumpet that they have milo as a main ingredient. 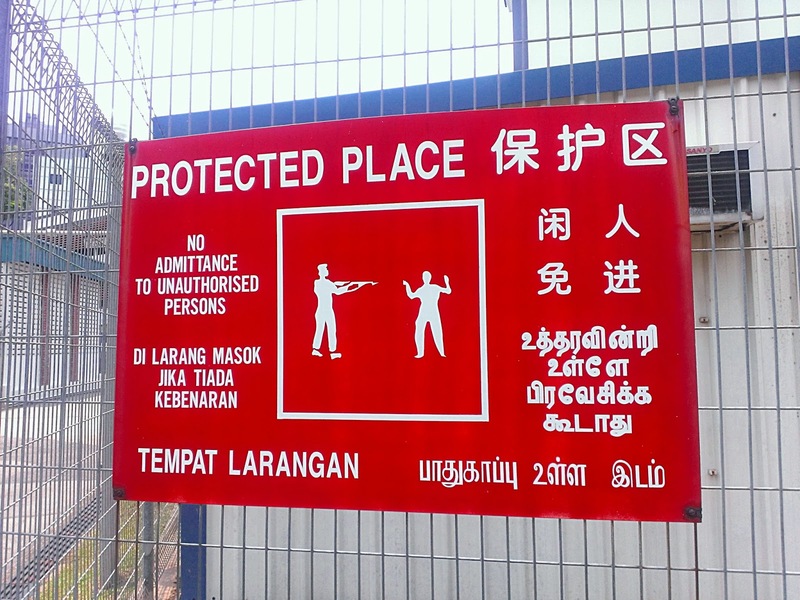 4) "Singlish," or Singapore English. It is truly its own language. There is a heavy Malay influence on the English spoken here. People especially like to put "-la" at the end of words, as in "Everything is okay-la?" Hearing this for the first time was a bit baffling, as I couldn't understand what they were saying. The Chinese influence comes into play with sentence structures. Example: one of the local foodie websites is hunrygowhere.com, an expression which is local shorthand for "I'm hungry, where should I go?" My favorite new phrase is referring to someone or something "stylo-milo." See above for reference. 5) "Queuing," or standing in line. From public transportation to food courts, people here love to stand in line. Long queues also bestow a measure of prestige, as hawker stalls with the longest lines are presumed to have the best quality food. Same with the money changer stands. Or more accurately, the complete lack of napkins. This might seem trivial but it can be a major problem for sloppy eaters (aka me). Some of the dim sum joints provide hand wipes but in general, one needs to be extra cautious when eating. Many hawker stalls also have hand washing stations, but again, paper towels or napkins are rarely available. The idea of national identity is a fairly complex concept here in Singapore. The country is quite young, realizing its full independence in 1965. 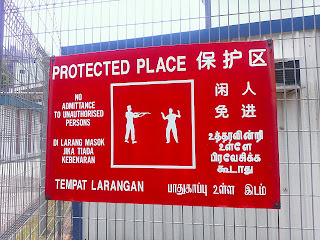 The population is mostly Chinese, with strong Malay and Indian groups also present. As a financial and shipping powerhouse, Singapore works extremely hard to attract foreign talent to work here. While this has clearly resulted in incredible prosperity and security, it also results in a population that holds strong ties to their respective home countries. Public events often feature government leaders stressing the importance of building a better Singapore for Singaporeans. There is a interesting piece published by some Singaporeans in June 2013 that you can read here. BONUS: Knowledge of Ohio. No one here has any clue where Ohio actually is. This is not surprising, as most Singaporeans seem to have connections with California or Texas. But they are too polite to say that Ohio isn't important and just reply, "Ah, Ohiooo." Luckily, since I went to Notre Dame, I can then respond that I'm actually from Chicago, which inevitably gets a few nods.